The most senior of the Protestant marching organisations has taken the unprecedented step of apologising to the clergy and parishioners of the Catholic St Patrick’s Church after three nights of march-related violence in north Belfast. The Royal Black Preceptory (RBP), also known as the Royal Black Institution, was responding to strong pressure from Protestant church leaders after a number of loyalist ‘kick the Pope’ marching bands engaged in sectarian acts outside St Patrick’s during its main annual parade on August 25. The PSNI police, the RBP and loyalist band members all ignored a Parades Commission ruling not to play music outside the church, while supporters hurled obscene abuse as parish priest Fr Michael Sheehan as he stood at the door. Unionist leaders such as the DUP’s local MP Nelson McCausland were present to support the illegal parade as the abuses took place. The RBP, the Orange Order and related groups often declare their loyalty to Protestantism as the motivation for their actions, and it dominates the oath sworn by its members. But after the extraordinary display of bigotry by the Royal Black marchers outside St Patrick’s, shocked Protestant church leaders were ready last week to sever ties with the marching organisations, inducing the unprecedented apology by the RBP. “We have always had good lines of communication with the Roman Catholic Church and we would intend to continue to maintain and consolidate these, away from the public gaze,” the RBP said on Wednesday. “The sense of injustice and hurt felt by the members of the Royal Black Institution is focused on the Parades Commission and its irrational and often irresponsible determinations. “The Royal Black Institution is founded on Christian principles and all of our processions are to and from an act of worship. The RBP apology came as a dispute continues to rage over a huge Ulster Covenant anniversary march planned by unionists on September 29. The march is set to be the largest and more triumphal parade to be organised by unionists in several decades, and will also pass St Patrick’s church and the intersection with the nationalist Carrick Hill. Three days of intense rioting by loyalists at the interface in north Belfast earlier this week has dramatically raised the stakes on the issue. 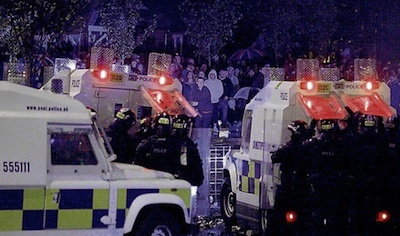 Hundreds of fireworks, petrol bombs, masonry and other missiles were thrown at police lines by a mob including regimented gangs of loyalist skinheads. A republican commemoration on Sunday was the ostensible trigger for the disorder, but its main purpose was clearly to increase pressure on the Parades Commission and the British government ahead of the Covenant march. The PSNI police warned someone “would be killed” if the rioting, which it said was orchestrated by loyalist paramilitaries, was not brought to a halt. In political circles, the sudden explosion of parade-related violence has created a sense of crisis. For Sinn Féin, the apparent coalition of the Protestant marching orders, unionist political leaders and loyalist murder gangs has forced the party leadership to reconsider its stance on the marching issue. The British government has maintained a hands-off approach to the problem amid the appointment of a new set of Direct Rule ministers this week in London. However, both the First and Deputy First Ministers, the DUP’s Peter Robinson and Sinn Féin’s Martin McGuinness, finally broke their silence on the parades issue this week. Mr Robinson, who signed an open letter critical of the Parades Commission and the British Direct Ruler the day before violence broke out on Saturday August 25, continued to back what he and other unionists described as “civil disobedience”, while condemning both the commission and the scenes of violence. Bizarrely, both Peter Robinson and BBC television news separately invoked the spirit of Mahatma Gandhi in their attempts to explain the ritualised sectarianism of loyalists outside St Patrick’s church. Nationalist commentators have contrasted the current position of the DUP leader to that adopted when sectarian parades are brutally forced through Catholic areas -- also on the basis of decisions taken by the Parades Commission. “He cannot cherry-pick the rule of law,” said SDLP assembly member Conall McDevitt. It was the DUP leader’s role as First Minister “to uphold and protect the rule of law”, he added. “He needs to do this on behalf of everyone,” he said. Mr McGuinness said that behind-the-scenes discussions which took place last week were “sober and very frank” but that “much more engagement” was required over the coming weeks. He said it was important “that as we move forward to what will be a fairly massive Covenant parade in September, that no violence whatsoever ensues from such an event”. There was a duty on everybody to accept the determinations of the Parades Commission and to accept the rule of law. He said the “deliberate provocation” by the Young Conway Volunteers Band outside the Donegall Street church was “blatant bigotry and sectarianism”. “Isn’t it a very strange situation that you find someone such as myself, a leading member of Sinn Féin, the deputy first minister, calling into question whether or not there is a commitment from the loyal orders and senior unionist politicians to the rule of law?” he asked.